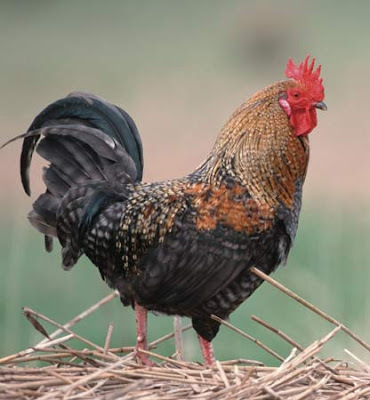 If you are just joining us on the Rooster Trilogy today, go back and read yesterday's post first! You'll be thrilled to read the tale of Betty vs Rooster and you'll just have better overall self-esteem knowing you've started at the beginning. My days on the farm are finished, but roosters still appear on the landscape around me. They come in various shapes, forms, and degrees of intensity. We all deal with the usual ones and they are manageable. We accept them as part of our lives: Drive into a car dealership and get out of your car. From all corners, the roosters lock their eyes on you, slowly rising to their feet, stretching. The begin to strut towards you. There are the people we hope to avoid because of their rooster-like qualities--the ability to hunt us down and barrage us with conversations filled with relentless details, a neverending carnival ride of minutia. Try as we like to break away, the sheer centrifugal force of their whirlwind of words, knocks us back, suctioned to whatever surface is nearby. Years ago, I was paired up with a co-worker on a prolonged teaching project. She and I were supposed to be equals, but she had definitely decided she was the boss and I would be the secretary. She was big, built low to the ground, wore colorful outfits and her neck jutted back and forth as she picked her way across campus throughout the day. I found myself scanning the quad thoroughly before leaving my office, but more often than not she'd be out there, see me emerge and stand stock still. Extending her neck, she would turn her eyes upon me, then bustle over at increasing speed, beak full of commands. As I stood there, watching her approach, the six-year-old mind came to the surface immediately. It was all I could do not to take off at a dead run. In addition to these human roosters, we all deal with inanimate roosters as well. There are the roosters of Christmas shopping and housecleaning. Every April 15th when a rooster badly disguised as an eagle shows up on our yards, we all nod and exchange knowing glances. We share these roosters and commiserate with one another about them. However, the roosters that are the hardest to deal with are the roosters no one else can see. One small incident can release roosters of shame, disappointment, sadness from the cages in which we had thought we had locked them so securely. The rooster of self-doubt sabotages our dreams. There are the twin roosters of skepticism and anxiety that strut into our lives as we are making major decisions. The rooster of depression paralyzes his victims for days, weeks, months at a time, trapping them in their homes, afraid to come out. Sometimes, the rooster of grief shows up on the anniversary date of a death, to crow his shrill cry, taking us back breathtakingly fast to a pit of mourning out of which we had fought hard to climb. When I was six one of my sister said, "It's just a stupid rooster. I'll show you." We went outside and the rooster, thinking I was alone, appeared immediately. My sister took off, chasing the rooster across the barnyard, running so fast he was forced to make an effort at flying. "See?" she said, coming back to me. "Just chase him off when we comes at you." Since we spend a good deal of our lives dealing with roosters I would like to believe that my sister was right--that is really is as simply as shooing them off. Well-meaning friends give us well-worn advice about the problems in our lives, but in their eyes it's just a pesky chicken in the yard, not the dominate and powerful rooster we see. The fact that my sister could chase off the rooster was not surprising to me; it wasn't her rooster. That rooster was not coming after her. But in mind, the rooster remained ten feet tall. The rooster had convinced me that he was stronger than I was. So it is with all the roosters we face in our lives. Thank you for this. I needed it today. :) Besides, the image of a short, colorful human rooster still has me laughing heartily!